When I started to make these muffins, I didn't set out to create a new recipe. I simply wanted to replace the photos in this older Double Chocolate Muffins recipe. (Some of the old photos on this blog just aren't Pinterest-friendly if you know what I'm sayin'.) As I got going on my baking though, I decided to update the recipe just a little bit. I enjoy the classic combination of chocolate and berries. Plus, berries are so pretty! And the gorgeous natural hues that berries display speak to their abundant and health-promoting antioxidant content. Meaning these muffins are health food. Pretty much. 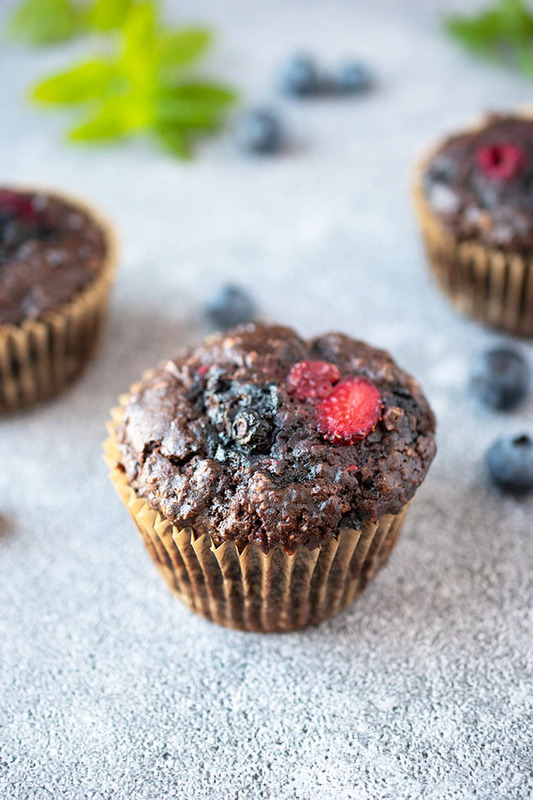 If you don't want berries in your muffins today, please do go back to the old recipe (those muffins have lovely shredded coconut in them too!). I put some extra berries on top of each muffin just because they are so darn pretty. And I used frozen mixed berries for convenience. This particular mix is made up of strawberries, blueberries, raspberries and blackberries. (Keep a bag in the freezer for smoothies and other good stuff.) A little chocolate drizzle couldn't hurt on a special occasion too. I have suggested using coconut oil in these vegan muffins. But you could certainly use a light olive oil or grapeseed oil. My favourite flour for muffins is light spelt flour, which has less gluten than ordinary all-purpose flour. But you can use all-purpose flour if that's what you have handy. The recipe also calls for a flax egg. I keep ground flaxseed in the freezer so I can always whip up an "egg." I like to stir flax into my oatmeal in the mornings for extra fibre too. Of course, seeing as these muffins are vegan, they are dairy-free and egg-free. The "double chocolate" is a combo of cocoa and melty chocolate chips. You can also dust these muffins with a little icing sugar (powdered sugar) for a festive touch. I may have gone overboard on mine. 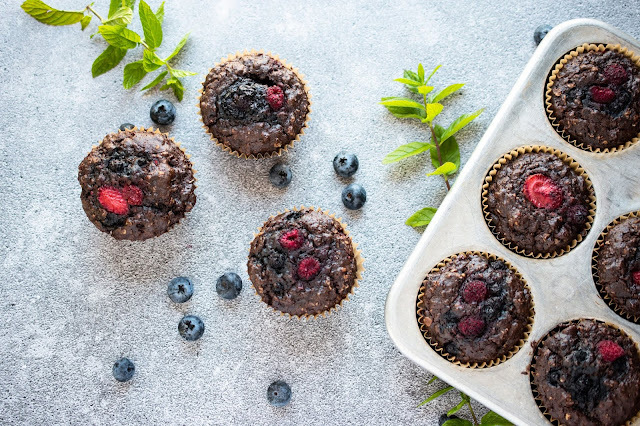 These Double Chocolate Berry Muffins have a rich chocolate flavour and nice bursts of berries and melted chocolate chips. 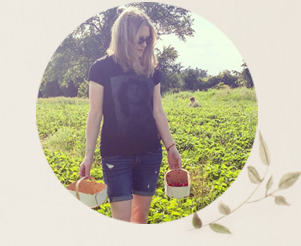 They have a decadent feel to them but they actually offer a good nutritional boost as snacks go, because they boast oats and flax and berries. They're great for getting extra nutrition into kids while offering them a chocolate goodie. Now do I go back and re-photograph the other Double Chocolate Muffins? Hmm. What about you? 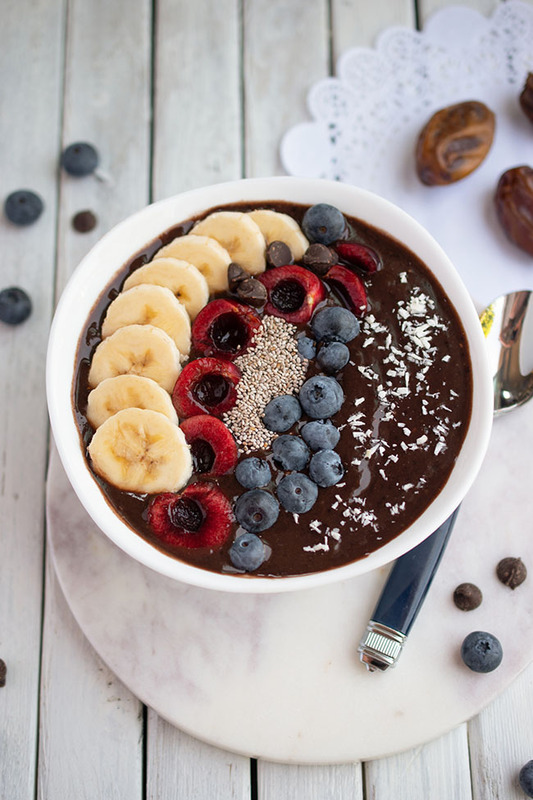 Do you like the combo of chocolate and berries? 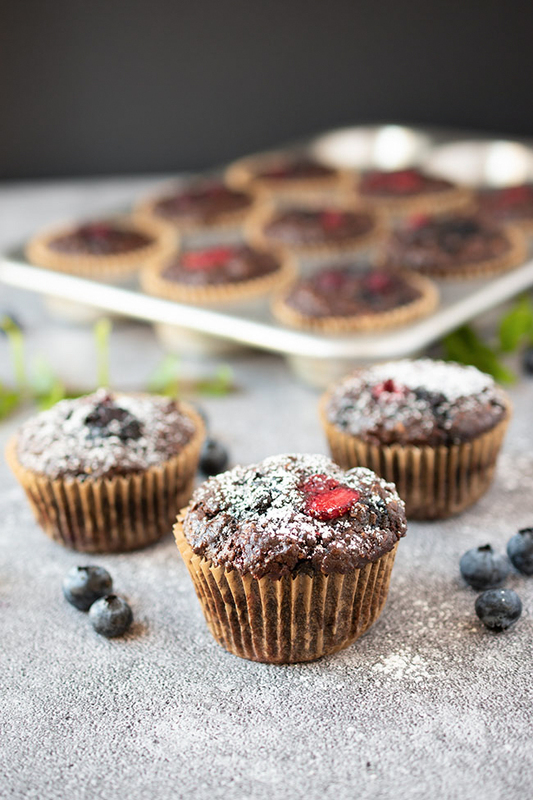 Which way would you make your muffins - with berries or without? In a small bowl, stir together the non-dairy milk and the oats. Put aside. In another small bowl, mix the flaxseed and water to make the flax egg. Let thicken for 5 minutes. In a large bowl, stir together the flour, baking powder, baking soda, salt, sugar, cocoa and chocolate chips. Stir in the oat mixture, flax egg and coconut oil. Gently stir in berries. Line a muffin tray with paper cups or spray with cooking spray. Scoop batter equally among 12 muffin cups. 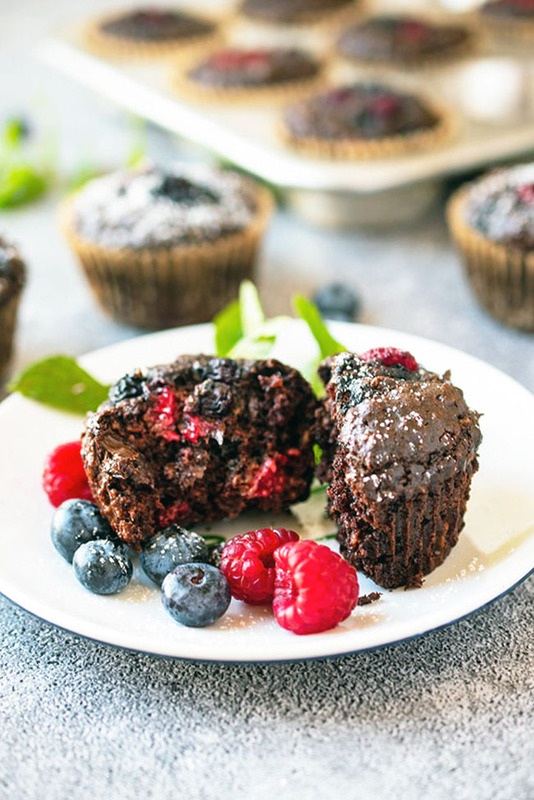 Put fresh or frozen berries on top of each muffin if desired. 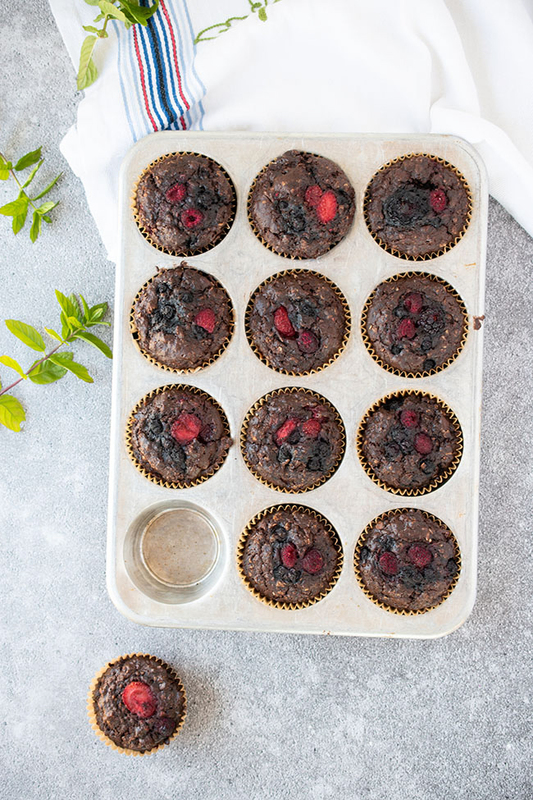 Bake for about 25 minutes, until muffin tops are dry and springy to the touch, or a knife inserted in the centre comes out clean (aside from melted chocolate chips and berries).